Mayor Ms. Huang, Ming-Hui (55) from Chiai City, Taiwan visited the Baseball Hall of Fame and Museum in Tokyo on June 19, 2014 to present a bronze statue of late WU Ming-Jie to Katsuhiko Kumazaki (72), President of the Baseball Hall of Fame and Museum as well as Commissioner of Nippon Professional Baseball. Batting No. 4, Pitcher WU Ming-Jie helped bring the southwestern city's former Kagi Norin Junior High School to the runner-up finish at the prestigious summer Koshien baseball tournament in 1931, when Taiwan was a colony of Japan. The inspirational feat of Kagi Norin School was made into a movie entitled “Kano” and was released in Taiwan in February, 2014. Mayor Huang mentioned that the film has been so successful as to register box office receipt surpass NT$300 (US$9.88 million). “Kano” will be released in Japan early next year. 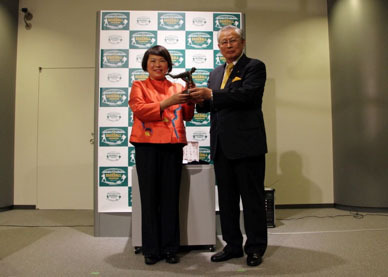 President Kumazaki thanked Mayor Huang and assured her that “the stature with its up-lifting feeling will help people beyond generations to appreciate baseball history of Japan.” The statue, 1/16 size of the original monument erected in Chiayi City, will be permanently displayed in the High School Baseball section of the Museum. The presentation ceremony was attended by over 40 people including the Mayor’s delegation, family members of the deceased and alumni of Waseda University Baseball Club where WU Ming-Jie played 80 years ago, registering the then record 7 homers at the　Tokyo Big-6 League. In August, 2014, the All-Star team of Kansai Big-6 will tour to Chiayi to play friendly games against National Chiayi University (former Kagi Norin school), Tatung Institute of Technology and Far East University. Kansai Big-6 League comprises: Kansai, Kwansei Gakuin, Ritsumeikan, Doshisha, Kinki and Kyoto University.